THE VENUE Bar & Lounge Re-Imagines The Livermore Nightlife Experience, Delivering Unparalleled Drink Service & Music to the City's Most Prime Location LIVERMORE, CA (2015) -- Livermore's night time landscape will unveil a new dimension with the debut of THE VENUE, the Tri-Valley's newest bar & lounge. Past the ropes, guests will escape into an atmosphere where music and quality drink service converge, creating a setting unlike any other. 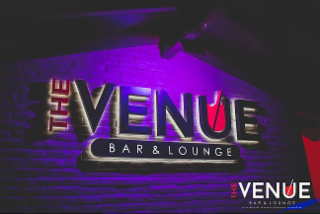 THE VENUE Bar & Lounge will be open 7 days a week! Open Monday - Friday from 1 pm - 1:30 am, Saturday 9 am – 1:30 am, and Sunday 9 am – 12 am. THE VENUE is also available for private events. www.TheVenueLivermore.com A dress code will be enforced Friday and Saturday nights: no shorts, slippers or sports attire permitted. Stylish hats are OK.